Best taken with a a carbohydrate meal. Unavailable - Click here to be notified when the item is back in stock. 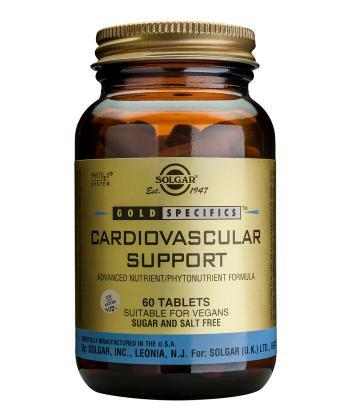 As a food supplement for adults, three (3) tablets daily, preferably with a carbohydrate meal, or as directed by a healthcare practitioner. PhytO2X (powdered blend of beta-carotene prep. and ascorbic acid) PhytO2X is a special blend of natural ingredients, the purpose of which is to maintain the freshness of the ingredients. microcrystalline cellulose, hydroxypropyl cellulose, vegetable stearic acid, silicon dioxide, magnesium stearate, cellulose gum, titanium dioxide, anthocyanins (from grape skin), vegetable glycerin, stearic acid. Fully reacted chelates, Albion process patent #4,599,152 Chelazomes. If you are pregnant, nursing, taking any medication or have a medical problem please consult your healthcare practitioner before taking this product. 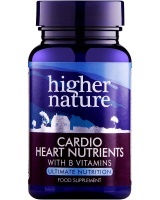 Higher Nature Cardio Heart Nutrients health supplement supplies key nutrients to support a healthy heart & circulation.